The modern method of goods to person order fulfillment (also known as “goods to man”) is an efficient strategy which saves warehouse operators both time and effort. Many facilities have moved far beyond the old days of staff having to move large distances to manually pick orders and track inventory changes using a paper-based system. Increasing client demand and a rise in global distribution expectations have challenged logistics managers to think outside of the box and turn to more advanced technology to meet their throughput objectives. How does goods to person order fulfillment work? Warehouse managers have quickly found themselves with a growing volume of SKUs and clients that expect to receive their orders in record time and in perfect condition. With the goods to person order fulfillment system, operators are able to remain at an ergonomic workstation and prepare orders with goods that are brought directly to them by an automated system. As a result, the safety of products, accuracy of orders and processing speeds are all greatly improved upon. So how do you go about selecting the right solution for your goods to person strategy? Automated storage and retrieval systems (AS/RS) are one of the main reasons why goods to person order fulfillment methods have been adopted by so many successful distribution centers. Here are some examples of innovative systems which help maximize the advantages of this type of order preparation. Stacker cranes are often considered the stars of goods to person order fulfillment techniques. Stacker cranes for pallets and trilateral stacker cranes provide total control over the automated entry and exit of products. These customizable systems allow for maximum utilization of ceiling clearance heights for high density racking and can be installed in narrow aisles. Miniload systems provide efficient condensed storage and retrieval of boxes, totes and trays. The basic system is made up of two racking units, a high speed single stacker and a conveyor system, however more complex systems can be designed. Certain models can handle up to 540 boxes per hour (270 in and 270 going out), all without the operator having to move from his or her position. 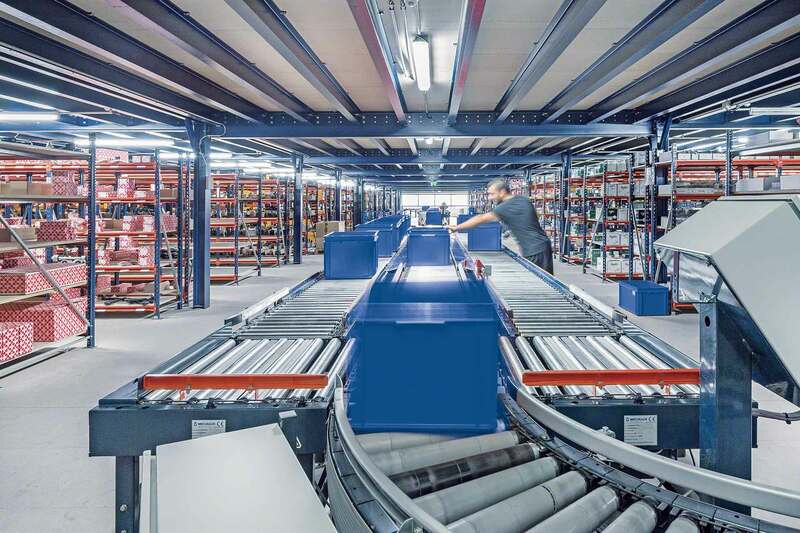 See how the Continental automated warehouse achieved a storage capacity of over 3,400 boxes using the Miniload warehouse system. Pallet shuttles are unique devices which are handled by stacker cranes, shuttle cars or semiautomatic designs can be installed to work directly with forklifts. They are driven by an electric motor which runs on rails through storage channels and charges when it returns to its cradle. This highly productive solution is cost effective and conveniently removes the need for forklifts to enter storage lanes. Staff safety: Reduce the number of workplace accidents by allowing staff to comfortably prepare orders at ergonomic workstations. Product security: Thanks to the features of automated storage and retrieval systems you can rest assured that stock units are handled safely and accurately tracked and accounted for at all times. Scalability and room for expansion: Automated storage systems can be configured based on your facility’s needs and expanded with additional modules during periods of growth. Speed and accuracy: Goods to man order fulfillment criteria takes your picking processes up a notch by eliminating employee travel time and reducing human errors. Additional implementation of put-to-light systems can even further enhance this accuracy. Customer satisfaction: Ultimately, increased efficiency and accuracy in the preparation of orders leads to more satisfied customers who are likely to return to your business in the future. With all of this said, don’t suddenly feel pressured to put all your eggs in one basket. Depending on the daily activity profile of your facility (total number of SKUs, daily unit volume, units per order, packing process and specific inventory characteristics), you may find that some operations should remain being picked manually while others are in desperate need of automated processes. Take the time to evaluate whether goods to man order fulfillment is the right fit for your facility and how the corresponding automated systems can take your logistics company to the next level.